Sip with style using Kate Aspen's Enchanted Party 15 oz. stemless wine Glasses! 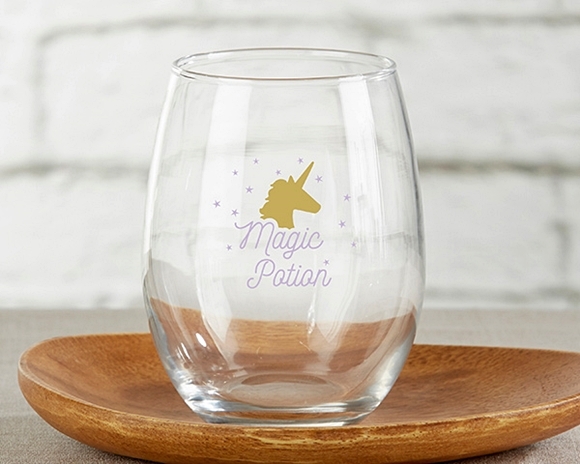 Each glass features a starry golden unicorn print above the words "Magic Potion" printed in purple in a 1970's-inspired font. PLEASE NOTE: Sold in a set of 4 and prices quoted below are per set. Please also note that while we package all personalized glassware with extra care, we cannot replace any glassware that may break while being shipped by UPS or FedEx. It's always a good idea to order extra quantity (5% is the rule of thumb) to account for shipping damage or unexpected guests. Due to personalization, there is a design setup fee of $39.00 that will be added to your order at checkout.